Family gatherings usually mean a feast of some sort. This time, my uncle was coming over for dinner, so we decided we would have a KFC dinner. Now, because of religious dietary restrictions, plus my mom being somewhat a health-nut, we don't eat at KFC. That means we had to make the KFC-style dinner ourselves. 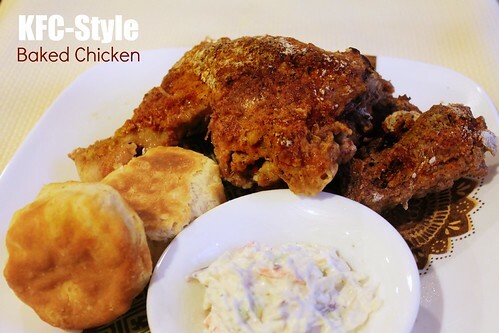 So today, I am sharing with you my family's take on KFC-style chicken. Oh, and I do apologize for the lack of good pictures. Late at night = bad lighting = bad pictures. Sorry. Marinate the chicken legs with the ginger-garlic paste, lemon juice, and 1 tablespoon of salt and leave for 1 hour - overnight. Grease a foil-lined baking sheet and preheat the oven to 400 degrees Fahrenheit. Combine the dry ingredients in a large bowl and beat the eggs in a separate large bowl. Roll a chicken piece in the flour mixture until it is fully coated. Brush off any extra clumps of flour. Dip the chicken leg in the beaten egg and once again roll it in the flour mixture until it is fully coated. Dust off any clumps of flour again or they will still be on the chicken once it is baked. Repeat these steps until all of the chicken pieces are covered in flour and on the tray. Bake the chicken in the oven until it is golden brown (around 40-45 minutes).